Juvederm is a gel made of hyaluronic acid filler that is used to fill wrinkles, lips, and depressions. When injected into lines and folds, it creates a natural, youthful look. It can be used by both men and women. Juvederm is commonly used to fill the nasolabial folds (the grooves running from the corners of the nose to the corners of the mouth), the marionette lines (the lines coming down from the corners of the mouth), the hollows under the eyelids, the lips and lip lines, and many other areas. Hyaluronic acid naturally occurs in your skin and normally functions to help hydrate the skin. The hyaluronic acid in Juvederm is synthetically manufactured and treated to provide more filling capacity than naturally occurring hyaluronic acid. Juvederm is often a first choice for filling the lips because of its smooth, gel like consistency. Results look and feel natural. With careful placement of the product, lips look natural and beautiful without looking overdone or like a duck. Juvederm can be used to fill the groove under the eyes (called the tear trough), but some patients get a large amount of swelling when the product is used in this area. Restylane is often a better choice. Both Juvederm and Restylane are made from the same substance – hyaluronic aced, but they are manufactured by different companies in different ways. This gives each of them their own, unique properties. Many injectors find Juvederm smoother and better for use in the lips. As mentioned above, Restylane is often preferred for filling under eye hollows. Both Juvederm and Restylane are used to fill smile lines and for facial contouring. Treatment with Juvederm is overall safe, fast, and effective and takes approximately 20 – 30 minutes. Results are immediate; although, most patients swell to some degree. It is usually subtle and does not lead to downtime. It typically resolves fully in 1 – 3 days. Allergy testing is not required. Bruising may occur and is more likely to occur when injecting the lips as this area is very rich in blood supply. To minimize the intensity of bruising, avoid blood thinners such as aspirin and ibuprofen for one week prior to treatment. As with any filler, more serious risks exist including infection and, rarely, occlusion of a blood vessel. Careful preparation of the skin is critical to reducing the risk of infection. Knowledge of the anatomy is an important factor in reducing the risk of occlusion. Juvederm comes in two formulations – Juvederm Ultra XC and Juvederm Ultra Plus XC. The XC part of the name indicates that the syringe of filler also contains a little bit of lidocaine – an anesthetic used to make injections more comfortable. Juvederm Ultra Plus is a more robust formulation, and it is used to correct deeper folds and deformities since it is a more robust product. Ultra is less viscous and has less lifting capacity. Therefore, it is often used in more shallow lines. The cost of any filler depends largely on how much is used. Juvederm is supplied in a pre-packaged syringe. Each syringe is filled with 1 milliliter of product. For perspective, 5 milliliters is a teaspoon. The amount of filler needed depends on the area(s) being treated. Since pricing is by the syringe, the cost of treatment ultimately depends on how many syringes are needed. A good injector will find ways to maximize the result with as little product as necessary. The length of time this filler lasts mostly depends on the area treated. Treatment of the nasolabial folds will usually last longer than treatment of the upper lip lines, for example. Juvederm usually lasts 6 – 8 months in the lips and 8 – 10 months elsewhere. Can I be treated on the same day as my consultation? Usually about 20 to 30 minutes, but it can be longer depending on how much we use and what areas are treated. It depends on how much volume you need and what areas are to be treated. Most people require 1 – 3 syringes for initial treatment. Typically, fewer syringes are needed for maintenance. How long is the recovery after treatment? Although we use various techniques to minimize bruising, some people do bruise. Most of the time, bruises are very small pinpoints around injection sites. 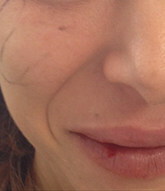 As mentioned above, bruising is more common when treating certain areas like the grooves under the eyes and the lips.